Rob van Sante and Janie Meneely will lead the chantey sing. The Reedville Fishermen’s Museum will host All-You-Can-Sing Chantey Night from 7 to 9 p.m. July 14, at the RFM pavilion, 504 Main Street, Reedville. “Whether you can remember all 286 verses to ‘Drunken Sailor’ or can barely stumble through a hearty ‘yo ho ho ho’ you can join in the fray when the Reedville Fishermen’s Museum and local fans of nautical music offer up a special evening of all-you-can-sing sea songs (say that five times, really fast),” said director Lee Langston-Harrison. “We call it a chantey sing,” said co-host Janie Meneely, who routinely performs songs of the Chesapeake Bay. 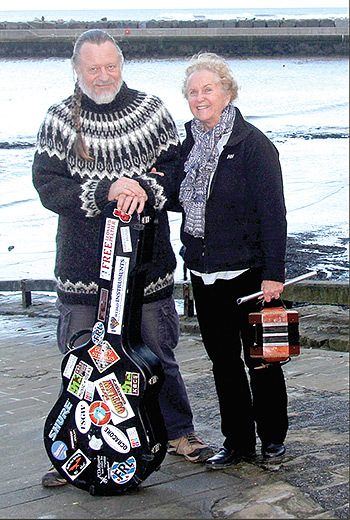 She’ll be joined by her husband, Rob van Sante, a folk musician from the UK who is no stranger to maritime music. Chantey sings are gatherings where the participants sing along on old favorites led by the likes of Meneely and van Sante, or volunteer to lead a song of their own choosing. Song sheets are provided (for borrow or for sale), but there’s no prohibition against tossing out a song that’s not on paper. At 7 p.m. sharp, she and van Sante will welcome the audience and begin to sing a familiar sea chantey, one that anyone can sing along on, said Meneely. “It can be something as simple as ‘South Australia’ or ‘Blow the Man Down,’” she said, but count on it having a rousing chorus. After that, they will invite audience members to lead a song, request a song, or simply toast the event. Meneely and van Sante specialize in songs that celebrate the history, legends and traditions of seagoing mariners as well as Chesapeake Bay watermen. “What better place for us to share our music than right here on the banks of the creek, close to where the river meets the lower Bay. And what better way for those who love sea chanteys to come and sing about maritime traditions in general,” she said. Some seating is provided. Folks may bring their own picnic and libations. RFM will have soda, beer and wine for purchase. All voluntary $5 donations will go to the continued work on the Skipjack Claud W. Somers.